Black-capped Chickadees (Poecile atricapilla) are year-round residents across the entire northern two-thirds of the United States and the southern half of Canada. In winter they visit bird feeders in flocks composed of their own species along with nuthatches, titmice, and downy woodpeckers. They are best known for their active, acrobatic behavior and their "chick-a-dee, dee, dee" call. In spring and summer the males sing a clear, usually two-noted whistle ("fee-bee"), the second note lower than the first. Chickadees are easily identified by their small body size, black cap and throat, and white cheeks. The sexes are alike. Black-capped Chickadees are permanent residents from Alaska south to the northern California border and eastward through the Great Plains north of Oklahoma to the Atlantic Coast as far north as Newfoundland. The Carolina Chickadee is the southeastern U.S. counterpart of the Black-capped, and in the limited region where they overlap, an experienced observer can distinguish the Black-capped by its more pronounced white edges on the wing-covering feathers (coverts) and its proportionately longer tail. Chickadees nest in tree cavities and nest boxes with an entrance hole of 1-1.25 in. , which is small enough to exclude House Sparrows. The birds are attracted to boxes partially filled with sawdust. The male-female pair bond can last for several years. Chickadees have the ability to regulate body temperature which conserves energy in very cold conditions. They lower their temperature at night by 10 degrees. Chickadees possess an excellent spatial memory. They can store seeds in tree bark and conifer needles and locate the caches a month later. 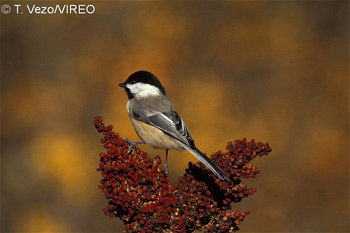 Chickadees change from their winter diet from 50 percent seeds and berries to 10-20 percent in the breeding season. The remaining food consists of insects (mostly caterpillars) and spiders. Chickadees are preyed upon by Sharp-shinned Hawks, raccoons and squirrels. House Wrens compete for nest cavities by attacking Chickadee eggs and young.